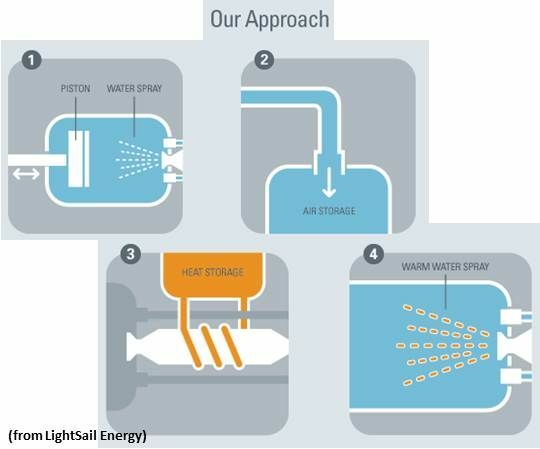 LightSail Energy, the energy storage startup backed by some of the country’s most prominent venture capitalist tech billionaires, has a plan to slash the costs of building its above-ground compressed air storage systems. But it’s not divulging details of exactly how it’s going to do it. Danielle Fong, LightSail’s 27-year-old co-founder and chief scientist, revealed the plan last week in a presentation at an event hosted by The Atlantic magazine in San Francisco. Amidst her slides, one stood out -- a cost comparison between two competing battery technologies, LightSail’s current version of its technology and a mystery “V2” version now under development. This cellphone photo is a little blurry, but direct your attention to the last two cost columns, representing LightSail's current technology and its next-generation technology, and the orange-colored portion of the columns, which stand for capital costs. 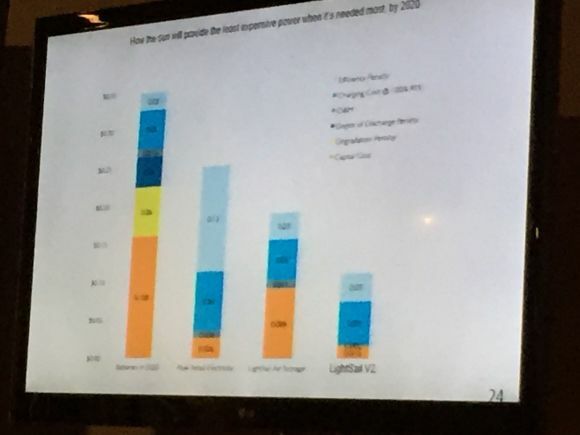 The “V2” technology, at the far right of the slide, shows an enormous drop in LightSail’s capital costs, compared to its existing technology. LightSail has raised more than $42 million from French Energy giant Total, Peter Thiel, Bill Gates, Khosla Ventures, and Innovacorp, in pursuit of a compressed air energy storage (CAES) system that doesn’t rely on underground caverns as a storage medium, as the world’s only existing commercial CAES systems do. Last month, another above-ground CAES startup, SustainX, abandoned those plans in announcing that it was merging with General Compression, a startup that’s using underground salt caverns to store compressed air. LightSail says its use of spun carbon-fiber tanks has allowed it to solve the cost problems faced by SustainX, which was using traditional steel tanks. It also claims that it has come up with a way to capture and store both the mechanical energy and the thermal energy used in compressing air by injecting a cool water mist into the compression chamber as the air is compressed, reducing the heat that is generated as air is compressed. 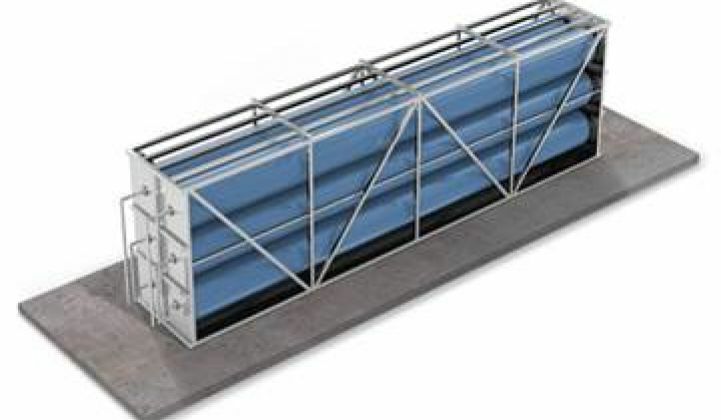 When the captured pressurized air is released back through the system, the heated water is re-infused into it, allowing that heated air to return more energy. In an interview after her on-stage presentation, Fong declined to comment further on how changing proportions of heat and pressure in LightSail’s carbon-fiber storage tanks could yield such a radical cost decrease. Instead, she pointed to projections of a 2x decline in carbon fiber costs, as well as an improvement in the economics of volume production of the engines to convert its compressed air to electrical energy, as the driving factors. An expansion system utilizes external combustion of its residual warm exhaust air, in order to heat incoming compressed air. The heat of this external combustion is communicated to the incoming compressed air through a heat exchanger. The expansion system may be incorporated into an energy storage device also featuring a compressed air storage unit supplied by a compressor. Where the stored supply of compressed air is depleted, the energy storage device may continue to supply electricity on demand through operation as a heat engine, with the compressor being driven directly (e.g., on a same rotating shaft) or indirectly (via generated electrical power) by the expansion system. Multiple expanders of the same or different types (e.g., rotating, reciprocating), may be utilized in parallel and/or in series (e.g., multiple stages) depending upon the particular application. Multi-stage embodiments featuring internal combustion in low pressure stages, may be particularly suited for placement in vehicles. Fong told the audience at last week’s event that LightSail has tested the high-pressure portion of its system, and is developing the low-pressure portion in preparation for field trials to take place next year. LightSail has two field projects announced to date -- a California Energy Commission-funded project to store solar power at a Ventura County naval base, and a Nova Scotia, Canada-based project to store energy from a wind turbine. The end goal, Fong said, is an energy storage technology that doesn’t suffer the long-term degradation and efficiency losses of electrochemical batteries. Replacing batteries with the proven simplicity and durability of engines could bring energy storage costs within reach for mass deployment in support of intermittent wind and solar power, she said. In one sense, LightSail is positioning itself against energy storage projects using batteries of all descriptions, including lithium-ion, advanced lead-acid, sodium sulfur, aqueous zinc and flow batteries. Companies ranging from Tesla to AES Energy Storage are seeking to prove cost-effectiveness for applications ranging from short-duration grid frequency regulation and building demand management, to multi-hour energy shifting to support a more renewables-rich energy system. LightSail laid off a small number of employees last year, and has missed its initial commercial launch timeline, so it has some catching up to do to prove it has a feasible alternative. But in another sense, LightSail is in common cause with other energy storage technologies seeking to allow renewable energy to grow to scale, Fong said. If the world is to replace the fossil fuel-fired power plants that are the largest single source of carbon dioxide emissions responsible for climate change, that needs to happen in the next decade and a half, she said -- meaning we’re going to need all the technology breakthroughs we can get.